Our Community Building department focuses on transforming neighborhoods and civic engagement. We engage people from all walks of life in activities that will increase their leadership skills and connect them to the community. We infuse new life into neighborhoods through carefully designed strategies to address physical, economic, and social issues by collaborating with residents, local churches, businesses, government agencies, and other nonprofits. Community Leadership Training – NHSSF works to develop the skills of local leaders through our Community Leadership Training Program. Community Leadership Forum (CLF): This program is a compressed two-day version of the national NeighborWorks® Community Leadership Training Program. The goal of this program is to allow for a large group setting where residents from diverse neighborhoods come together to learn, exchange ideas and experience the leadership development process. The CLF can serve as a precursor for participants who wish to further develop leadership skills in the seven-week Community Leadership Institute. Community Leadership Institute (CLI): This seven-week institute guides a cohort through an in-depth leadership development process. Building and expanding on the skills from the CLF, the CLI invites local leaders to teach classes on such topics as effective communication, working with community leaders, business development, and more. The CLI frames these skills through the lens of asset based community development. Volunteer Program – NHSSF provides direct service volunteer opportunities in the community as well as hands-on volunteer opportunities within the NHSSF office. Community paint and beautification days (CPBD): During CPBD, we assist existing homeowners with limited incomes to improve their homes by providing exterior painting and light landscape restoration. Community paint and beautification days brings together NHSSF staff, sponsors, community and corporate volunteers to work alongside residents on a shared common goal, helping to break down socio-economic barriers that exist in our community. The mission of CPBD is to empower homeowners with a sense of pride in their home and community while helping to revitalize their neighborhood’s physical condition. Other Volunteer Opportunities: NHSSF occasionally seeks clerical/administrative assistance and also hosts one-time community service projects. To find out about any current volunteer opportunities visit www.nhssf.org/volunteer. Corporate Community Engagement Program (CCEP) – The Corporate Community Engagement Program provides a way for corporations & organizations to bring a group of employees together to participate in an impactful neighborhood service project. Your volunteer project will be a team building experience that provides an opportunity to strengthen leadership, communication, and management skills while supporting NHSSF’s mission. NHSSF invites your organization to participate in our Corporate Community Engagement Program! To find out more about volunteer opportunities, please click here. The 79th Street Corridor has suffered from blight and disinvestment for over 30 years. 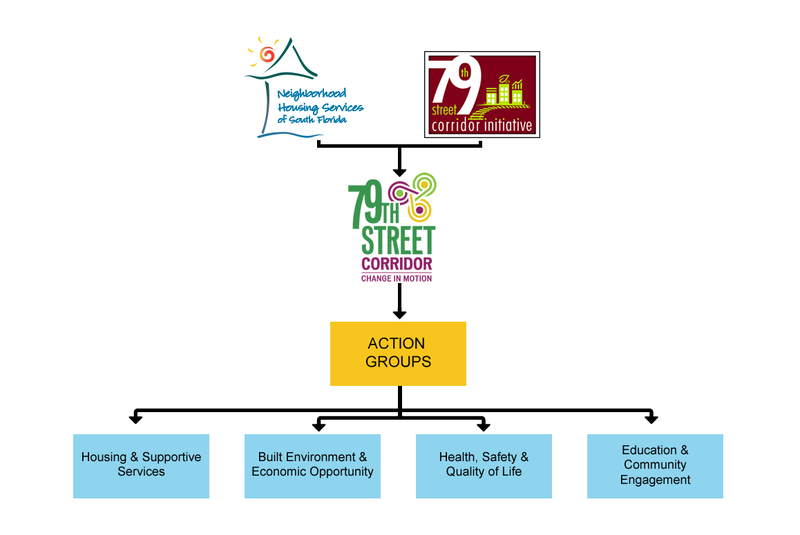 Partnering with the 79th Street Corridor Neighborhood Initiative we brought together a cross-sector of over 25 organizations to form the 79th Street Coalition for Change (79StCFC).